These meatballs turned out really yummy! They had lots of flavor and I didn't miss the breadcrumbs at all. The grated parmesan cheese makes up for it. It works as an excellent binder, in addition to the egg, and helps keep the meat moist. These would make perfect meatball subs. You can use the revolution rolls as buns. Don't know what they are? Well, they are the best thing next to sliced bread! Check them out! 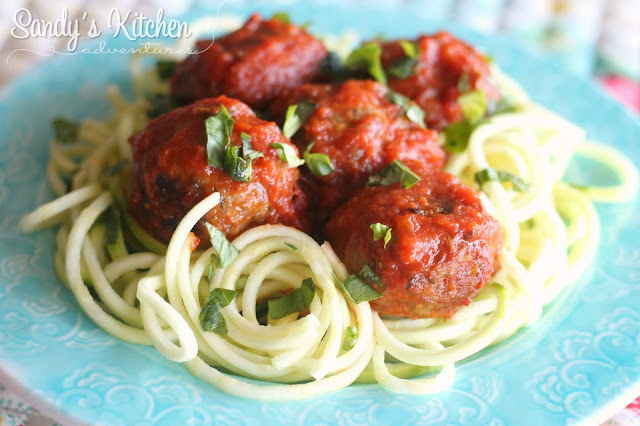 Serve these yummy meatballs over 1 cup of zucchini noodles or spaghetti squash and you have a wonderful Italian dinner! Now that's amore! Enjoy! Preheat oven to 350 degrees. Combine all ingredients except the diced tomatoes in a bowl until combined. Form balls from the meat. Bake for 20 minutes or until done. Add the meatballs and Rao's marinara sauce to a medium sized saucepan over medium heat until heated thoroughly. Divide into 3 equal portions.